11 May 2015 - Kendal and Stewart shine in a bland adaptation of Coward's dated classic. 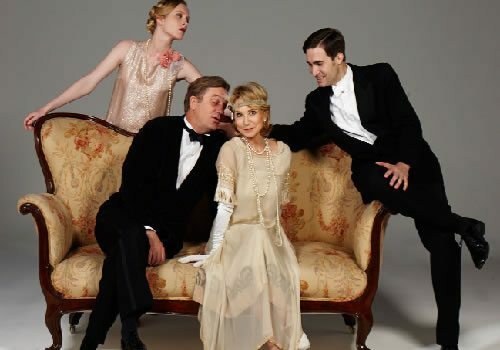 Director Lindsay Posner’s version of Noël Coward’s Hay Fever proved such a success at the Theatre Royal in Bath that it now transfers to London’s West End. Hay Fever is a hilarious farce that focuses on the Bliss family as they each invite a guest to spend the weekend at their English country house. However chaos ensues as the audience watch the hosts misbehave somewhat, scaring their guests away. Felicity Kendal reprises her role of Judith Bliss, which won her great critical acclaim in the Bath production. Judith is the somewhat over dramatic mother of the family, desperate to the be the centre of attention. The show is set across three acts; Act 1 takes place on “A Saturday afternoon in June,” Act 2 is set “After dinner that night,” and Act 3 is set “The next morning.” Over the course of just 24 hours the Bliss family manage to put on a rather awkward yet entertaining display of overwrought theatrics. Despite being written over 90 years ago in 1924, Noël Coward’s Hay Fever is just as humorous and riotous as it was back in the early 20th century. Hay Fever features designs by Peter McKintosh, lighting by Paul Pyant, sound by Fergus O’Hare and with compositions from Michael Bruce. Hay Fever is not explicitly offensive but is unlikely to be engaging for young children. Teenagers may enjoy the show if accompanied by an adult.